Your restaurant offers a home delivery service but you have no way to know how profitable it is? You have no idea how efficient your delivery staff is? Let alone know what your customers actually think of you? Discover the Trackin web-based food delivery software: automate your online marketing and increase your turnover with your deliveries! FoodTrackin is designed to answer all your needs, and turn your deliveries into real assets for your business. Easy to use, this food delivery software makes the whole food delivery process easier and faster. It helps you reach brand new customers and increase their loyalty to your brand. Find here 14 good reasons why you should use Trackin’s food delivery software to make your business grow! Talking about a new food delivery software might scare some of you off. “How much time am I going to need to install it? Will I be able to use it without having to call the technical hotline every other day?” Don’t worry, FoodTrackin is extremely easy to install! We set up your user account in just a few minutes, and your dashboard is ready to be used to upgrade your food delivery service. As far as your delivery guys are concerned, a simple download of the FoodTrackin app on their smartphone and they’re all set! We guide you step by step to upload your meals on your dashboard, and your new food delivery system is ready to serve you in no time! If you’re already using a perfectly good ordering system and don’t intend to get rid of it, no need to worry. Trackin ‘s food delivery software is designed to be compatible with any type of ordering system, as long as it works online. No need to type your order twice! Why lose such precious time? An online food delivery software offers many advantages. As restaurant manager, you get access to your dashboard from anywhere: desktop, tablet, smartphone…This software makes your life easier! No need to be inside your restaurants to manage their activity: you keep an eye on everything, wherever you are! You’re managing several businesses? With a single Trackin account, manage your entire delivery fleet and all your restaurants, from only one dashboard! With FoodTrackin, you know where your delivery guys are at all time. How? With their FoodTrackin app, track them on an interactive map from your dashboard! You know at any given time what they’re up to. Forget all this time spent trying to reach them on their cell to know their whereabouts: our delivery software shows you when they’ll be back to your restaurant, ready to take off for the next delivery! Seems sometimes hard to please all your customers when the number of orders overtakes the number of available delivery guys, doesn’t it? Rush hours are sometimes hard to handle! 10 orders waiting, only 2 delivery guys available…Impossible? We say no! FoodTrackin takes such issues into account and we made sure to design a software that could generates optimized delivery rounds. FoodTrackin generates a smart itinerary which enables your staff to make cost-effective deliveries! Dispatch several deliveries to a single delivery guy: his time is optimized and your customers satisfied! The optimized round features tells him who to deliver and in which order, giving him simultaneously the perfect itinerary! Besides helping you manage your orders and your delivery fleet, Trackin’s food delivery software helps you measure your performance at any time, from anywhere. By generating sales statistics (by day, week, month……), FoodTrackin gives you an overview of how profitable your deliveries are. All delivery key indicators are of course taken into account (salaries, gas, etc…) to give you a thorough business assessment. With this fantastic tool, automate all your decision-making process and optimize your delivery! On the FoodTrackin app, your delivery guy notifies his departure, which automatically sends a confirmation email and/or text to your customers. Within the text or email, they receive a URL which lets them track their food in real time! Your customers see where their delivery guy is, and when they know the precise time of his arrival. Forget calls from worried customers! You can focus on your delicious cuisine and spend less time on the phone. Geolocation makes everything more transparent for your customers, who like keeping an eye on their order ! A feature that most people enjoy: our survey shows that 84% of people won’t order from a restaurant if they have experienced a bad delivery service with it. Today it is almost impossible for you to know how each delivery goes, and how satisfied your customers are. With Trackin’s food delivery software, all your client information are stored and accessible through your dashboard. Through this dashboard, not only do you get an average customer satisfaction rating of your restaurant, but you can also see how each customer rated his or her delivery service. Got a bad rating given after a rather “chaotic” delivery? Don’t lose hope! Give a call to this customer and simply apologize if anything went wrong! Offer him/her a discount on their next order: they’ll appreciate the gesture! A reliable client database is good. Using it smartly is even better. Trackin took that aspect into account when it developed the restaurant dashboard. Through the dashboard, you generate promotional emails which can be sent to your favorite customers. A promotional code for their next order? A new product you want them to hear about? Customize your emails in a few clicks and send them to your entire database! Besides high quality deliveries, your customers will be more than pleased to hear from you and won’t think twice before ordering again! More than an extremely powerful management tool, Trackin is the first delivery software to improve your customers’ delivery experience. Besides offering the food delivery tracking, the fun and unique customer interface was thought and designed to get people to share their experience on social networks and online guides. After a successful delivery, we invite them to like your Facebook page and follow you on Twitter, all in order to develop your web audience. Then, we invite them to write a review on the online urban guide Yelp, and to share their experience on their own Facebook and Twitter accounts. A fantastic way for your business to gain visibility amongst hundreds of potential customers who will be more likely to see your name. From your restaurant, you can measure how awesome this social media tool is: we give you a monthly report of your performance on those different social media platforms, so you know who said what about your restaurant, when, and where. We showed you how Trackin’s food delivery software automates your online marketing. Your customers experience a unique and innovative delivery: we make sure they talk about it. But this goes beyond posting reviews or sharing your name! More reviews actually means a better web ranking for your restaurant. Your name will be found more easily by search engines and people will be more likely to come across your business when they browse the internet. Why it matters? According to a survey conducted by Trackin amongst hundreds of Internet users, 83% of people say they read customer reviews and ratings of a restaurant before placing an order Recommended Reading. Having loads of positive reviews can only be beneficial for your restaurant: more trust means more orders! The online food delivery software enables you to upgrade your payment methods and finally give mobile payment a try. Something trendy to offer your customers, who will find mobile payment much simpler and easier the usual cash or credit card payment. With Trackin’s mobile payment system, money is transferred directly from your customer’s account to yours. What’s better than innovation to make people talk about you? Using new technologies is an excellent way to make your restaurant one-of-a-kind and to attract new customers. Trackin’s food delivery software does not only optimize your deliveries, but it puts your restaurant on a map! Litteraly! We feel that offering customers a unique delivery experience is what’s always been missing with other softwares. Trackin decided to make a difference developing the food delivery tracking map and encouraging customers to share their experience on social media. By using a solution like Trackin, upgrade your brand image: all the technology savvy out there will rush to try out your restaurant! 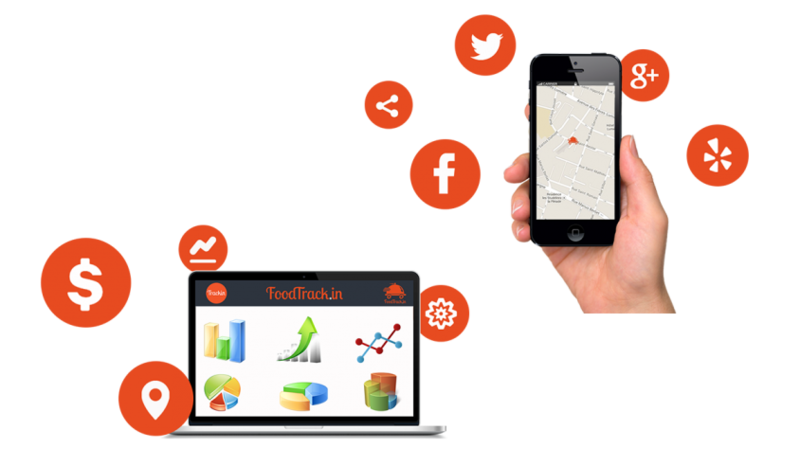 Needing more information to use FoodTrackin for your restaurant?